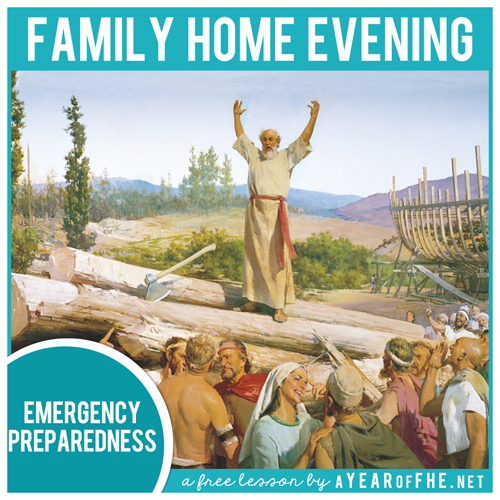 What You'll Need: scriptures, GAK 102/GAB 7: Noah Building the Ark, 9-1-1 Practice Keypad poster, two telephones, Emergency coloring page, coloring tools. Scripture: Doctrine and Covenants 38:30 - I tell you these things because of your prayers; wherefore, treasure up wisdom... in a manner which shall speak in your ears with a voice louder than that which shall shake the earth; but if ye are prepared ye shall not fear. There are big emergencies and small emergencies, but emergencies happen to people all the time. - Does this photo show an Emergency? - Is it raining yet? 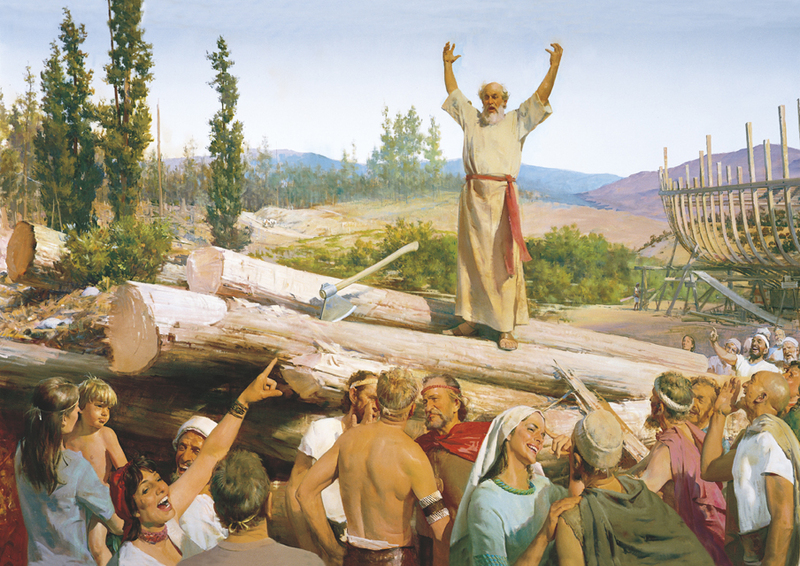 - If there is no emergency happening then why was Noah building an Ark? Noah is PREPARING for an emergency. Heavenly Father has asked us all to prepare for emergencies that might happen. Let's talk about some sorts of emergencies. A little fire in the house is an emergency. A bad guy coming into the house is an emergency, an unconscious family member is an emergency. Being unconscious is when you fall or get hurt and it looks like you're sleeping but can't wake up even if someone shakes you. In all of these emergencies you need help. You can get the help you need by getting a phone, turning it on and dialing 9-1-1. A little fire in the house, an unconscious person and a bad guy in the house are all things that would require a call to 911. A skinned knee, a stolen bicycle, or a lost pet wouldn't. If ever in doubt and there's no adult around to ask, make the call. It's much better to be safe than sorry. It's OK to be frightened in an emergency, but it's important to stay calm, speak slowly and clearly, and give as much detail to the 911 operator as possible. The operator will send firemen, police, or doctors to our house to help. You should open the door when they come and take them to the emergency. If there is a big fire in the house you must run from the house to our neighbors (tell you children which neighbors you trust and make sure they know how to get to their house). Our neighbor will help you call 9-1-1 from their house, but it's important to get away from the fire to be safe first. 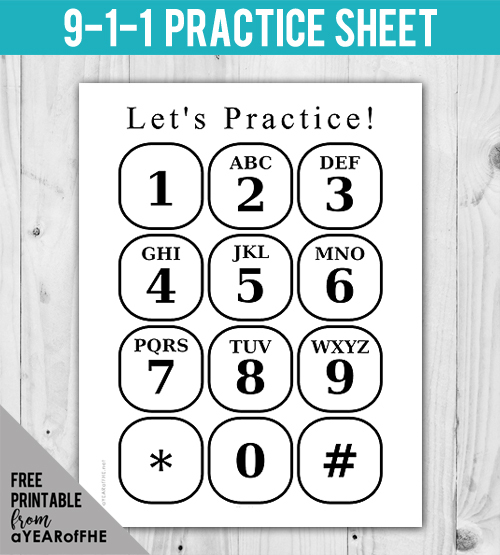 Use the practice keypad or a telephone to have each child just practice touching 9 then 1 then 1. Make sure they are familiar with the keys to touch before moving on to practice drills. I'll send an ambulance right away. I'll send the police right away. Practice #4 - You want to go bike riding with your friends and you search and search, but you can't find your bike. What should you do? (DON'T call 9-1-1. This is NOT an emergency). When we are safe and know how to handle an emergency we can feel safe in our home. Bear your testimony about the love that Heavenly Father has for His children. That he wants us to be safe and smart even when we are scared. Express confidence in your children that they can act well in an emergency if needed. CLICK HERE to read 10 WAYS TO PREPARE FOR FREE from www.SimpleFamilyPreparednes.com. Choose 1 that you will do today and 1 that you will do this week. Complete the items, involving the family! Yay! You did it! SIMPLE 72 HOUR PREPAREDNESS eBOOK // I highly recommend this eBook from the website www.simplefamilypreparedness.com It costs $10, but is really worth the money in my opinion. I get really overwhelmed at the thought of building 72 hour kits and this book totally made it simple and doable. I want to let you know this is absolutely the BEST family home evening website I've EVER found. Thank you so much for sharing your talents - they are so wonderful for so many families! We look forward to FHE every week now. I don't stress about lessons, and the kids are really enjoying them. THANK YOU. WOW!! Thank you ... this will help my family and me so much! I am so thankful for your time and effort to post this every week. Our family benefits from it so much. Don't ever stop! Thank you!! We have decided to make it a priority to get our emergency preparedness plan in order, and your lesson plan here is PERFECT! for helping my young children be prepared, without being scared. Thank you!! OMGOSH! this is my new favorite website!!! thank you, thank you, thank you!!! I love how my 4 year old can relate to this and the keypad to practice on is so smart!!! I love your site. I am am excited for this lesson because it is age appropriate for my kids. I like your scenarios as well as the 911 practice sheet. Thank you for your hard work in putting this stuff together. great idea! it's always good to make sure the little ones have practical knowledge like this. excited to use this tonight! Thank you for this excellent tool to use with my K/1st co-op. Really, this was perfect. Just what I was looking for for my young children. Thx for the print outs! They are awesome! Thank you for sharing your talents. You should know that you have helped my family (and I am sure many others) have FHE more often. Thanks again! This was exactly what I was looking for today!! You are wonderful! 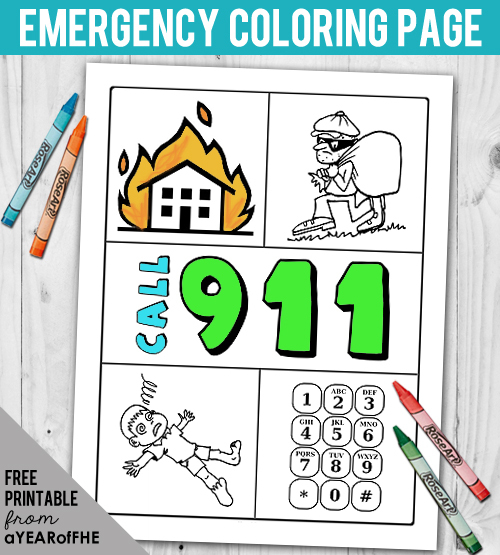 My kids will love to color your coloring sheet!! Thank you for taking the time to help all of us out!! This is just what I was looking for! Thank you! Thank you for this lesson. I am teaching a preschool class about "E is for Emergency." We'll be using your color page and your lesson plan, then practicing fire drills with the smoke alarm going off. Also, Stop, Drop, and Roll. Thanks! Thanks for this! Love the coloring page for my girls!